Hearing is believing! You can't out-scream this whistle! Almost everyone, from small children to seniors, can benefit from our patent pending Jet Scream's piercing whistle. The Ultimate Survival Jet Scream Whistle is a superb, low-profile signaling tool that is just as useful in the city as it is in the woods. You don't need a bulky whistle to make a loud blast and this little device proves it! Survival, Inc.'s acoustic experts have designed a unique whistle that focuses man-made air streams through harmonically tuned chambers to create a piercing shriek that out-screams any other noise. So whether you're hailing a cab over city traffic or signaling for rescue in deep woods, our Jet Scream Whistle will do the trick. Make sure your children have a Jet Scream with them wherever they go, especially when unescorted by an adult - playing in the woods, in the street, or when they walk to school. Give them a foolproof tool to signal for help in dangerous situations, and teach them how to use it. The scream of a child may seem loud at home, but it can easily be drowned out or muffled by outside noise. Wouldn't you feel more comfortable if your child had one of the world's loudest whistles in the bottom of his pocket or securely attached to the zipper of his favorite jacket? Carry Jet Scream with you in the city to protect you from crime or signal for help in the event of injury. And of course, you should carry it with you in the great outdoors - whether you're camping, hiking, or hunting, you never know when you may need some help. And don't forget that due to its pea-less design, Jet Scream even works when wet, making it the perfect accompaniment to all outdoor activities near rivers, lakes, or oceans. So whether you swim, kayak, canoe, surf, or fish - Jet Scream is an essential tool to help ensure that all of your recreational experiences are positive ones. Jet Scream is sleek and streamlined and will fit unobtrusively in your pocket. In addition, it includes a 6-inch lanyard attachment for your convenience. 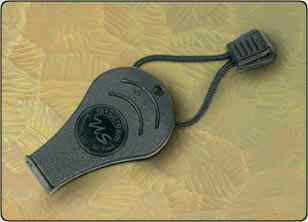 Hook it to your key chain, your purse, your backpack, your wrist, or anywhere else that is easily accessible. Just make sure you have one with you.